3.1.7.10 The following principles are basic rules of accounting and financial reporting for cash based cities, counties, and special purpose districts. A governmental accounting system must make it possible to determine and demonstrate compliance with finance related legal and contractual provisions. A governmental accounting system should be organized and operated on a fund basis. A fund is defined as a fiscal and accounting entity with a self-balancing set of accounts recording cash and other financial resources, together with all related liabilities and residual equities or balances, and changes therein, which are segregated for the purpose of carrying on specific activities or attaining certain objectives in accordance with special regulations, restrictions, or limitations. Basis of accounting refers to when revenues and expenditures are recognized and reported in the financial statements. Revenues are recognized only when cash is received and expenditures are recognized when chargeable against the report year’s budget appropriations as required by state law. This generally results in revenues being recognized when delivered to the government or government’s agent and expenditures being recognized when paid. Warrants and checks are considered paid when issued. An exception to expenditure recognition would be during any open period after the close of the fiscal year when expenditures can be charged against the previous period for claims incurred in the previous period. Open periods are required by statute for cities (RCW 35.33.151 and RCW 35A.33.150) and allowed for counties (RCW 36.40.200). Special purpose districts which use the county or a city as their treasurer may use the same open-period as their treasurer. If a district acts as its own treasurer, no open period is allowed by statute. Revenues and expenditures should be reported at gross amounts by account and not netted against each other. Revenues and expenditures should be recognized for all receipts and payments of a government’s resources, including those where the cash is handled by an agent (such as a bank, underwriter, etc.) on behalf of the government rather than handled directly by the local government. For example, debt proceeds wired directly to an escrow account, payments by the State Treasurer’s Office to vendors for items purchased with LOCAL resources, etc. Interest earned on investments may be recognized at cost, amortized cost or fair value in accordance with the government’s disclosed accounting policy. In addition, revenue and expenditures should also be recognized when the government agrees to forgo revenue in exchange for reduction of expenses (offsetting agreement) or receipt of an asset (e.g., acquiring an asset in exchange for reduced permit fees, etc.). In such cases, the transaction should be recorded as if the cash was received and expended in order to reflect the legal transaction. This basis results in no reported assets other than cash and investments and no reported liabilities. For example, purchases of capital assets are expensed during the year of acquisition without any capitalization of capital assets or allocation of depreciation expense. However, please be aware that certain liabilities should be reported on Schedule 09 and in the notes in financial statements. 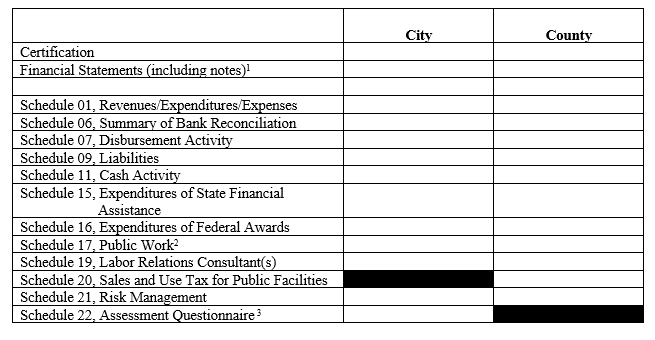 Since counties account for special purpose districts in their accounting systems as agency funds, they often provide the districts with reports showing assigned fund codes 630-699. These codes refer to the fund from the county perspective. 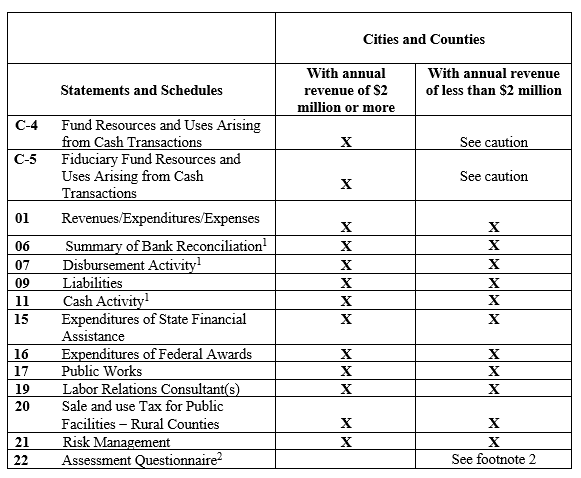 A district has to “reassign” the county code to the code appropriate to the fund type it is reporting (e.g., if the district’s general fund is coded in the county records as 663, the district in its annual report has to code this fund as 001). Code 000 General (Current Expense) Fund – should be used to account for and report all financial resources not accounted for and reported in another fund. For reporting purposes the local government can have only one general fund. Code 100 Special Revenue Funds – should be used to account for and report the proceeds of specific revenue sources that are restricted or committed to expenditure for specific purposes other than debt service or capital projects. Restricted revenues are resources externally restricted by creditors, grantors, contributors or laws or regulations of other governments or restricted by law through constitutional provisions or enabling legislation. Committed revenues are resources with limitations imposed by the highest level of the government (e.g., board of commissioners, city council, etc.) through a formal action (resolution, ordinance) and where the limitations can be removed only by a similar action of the same governing body. Revenues do not include other financing sources (long-term debt, transfers, etc.). The term proceeds of specific revenue sources establishes that one or more specific restricted or committed revenues should be foundation for a special revenue fund. They should be expected to continue to comprise a substantial portion of the inflows reported in the fund. It is recommended that at least 20 percent is a reasonable limit for restricted and committed revenues to create a foundation for a special revenue fund. Local governments need to consider factors such as past resource history, future resource expectations and unusual current year inflows such as debt proceeds in their analysis. Other resources (investment earnings and transfers from other funds, etc.) also may be reported in the fund if these resources are restricted, committed, or assigned (intended) to the specific purpose of the fund. All revenues have to be recognized in the special revenue fund. If the resources are initially received in another fund, such as the general fund, and subsequently remitted to a special revenue fund, they should not be recognized as revenue in the fund initially receiving them. They should be recognized as revenue in the special revenue fund from which they will be expended. So, the local governments can either receive resources directly into the special revenue fund, or account for the resources as agency deposits in the receiving fund and, after remitting them, recognize them as revenue to the special revenue fund. 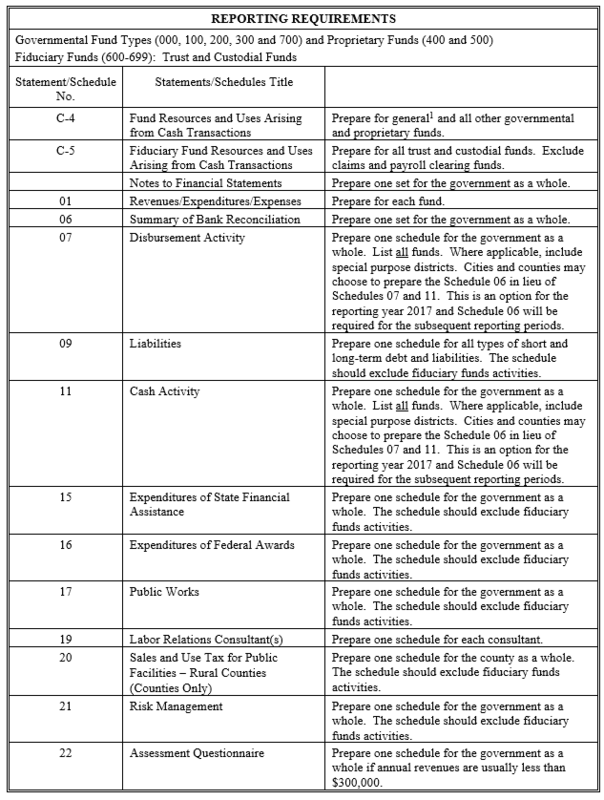 The state statutes contain many requirements for special funds to account for different activities. The legally required funds do not always meet standards for external reporting. So, while the local governments are required to follow their legal requirements, they will have to make some adjustment to their fund structure for external financial reporting. Code 200 Debt Service Funds – should be used to account for and report financial resources that are restricted, committed, or assigned (intended) to expenditure for principal and interest. Debt service funds should be used to report resources if legally mandated. Financial resources that are being accumulated for principal and interest maturing in future years also should be reported in debt service funds. The debt service transactions for a special assessment for which the government is not obligated in any matter should be reported in an agency fund. Also, if the government is authorized, or required to establish and maintain a special assessment bond reserve, guaranty, or sinking fund, it is required to use a debt service fund for this purpose. Use enterprise funds (400) for debt payments related to utilities and other business activities. Code 300 Capital Projects Funds – should be used to account for and report financial resources that are restricted, committed, or assigned (intended) for expenditure for capital outlays including the acquisition or construction of capital facilities or other capital assets. Capital outlays financed from general obligation bond proceeds should be accounted for through a capital projects fund. Capital project funds exclude those types of capital-related outflows financed by proprietary funds or for assets that will be held in trust for individuals, private organizations, or other governments (private-purpose trust funds). Use enterprise funds (400) for capital projects related to utilities and other business activities. Code 700 Permanent Funds – should be used to account for and report resources that are restricted to the extent that only earnings, and not principal, may be used for purposes that support the reporting government’s programs – that is for the benefit of the government or its citizens (public-purpose). Permanent funds do not include private-purpose trust funds which account for resources held in trust for individuals, private organizations, or other governments. Separate funds are not required for bond redemption, construction, reserves, or deposits, for any utility. If separated, use 400 series number. Separate funds are not required even though bond covenants may stipulate a bond reserve fund, bond construction fund, etc. The bond covenant use of the term fund is not the same as the use in governmental accounting. For bond covenants, fund means only a segregation or separate account, not a self-balancing set of accounts. Local governments may separate operating, capital projects and debt functions of enterprise funds. However, when reporting such proprietary activities, all those functions should be contained in one fund. Code 500 Internal Service Funds – may be used to report any activity that provides goods or services to other funds, departments or agencies of the government, or to other governments, on a cost-reimbursement basis. Internal service funds should be used only if the reporting government is the predominant participant in the activity. Otherwise, the activity should be reported in an enterprise fund. Note: The new definitions of fiduciary funds are required for reporting fiduciary activities in FY 2019 (i.e., reports submitted in 2020). Additional information regarding these changes is available here. Code 600 Fiduciary Funds – should be used to account for assets held by a government in a trustee capacity or as a custodian for individuals, private organizations, other governmental units, and/or other funds. These include (a) investment trust funds, (b) pension (and other employee benefit) trust funds, (c) private-purpose trust funds, and (d) custodial funds. Code 600-609 Investment Trust Funds – should be used to report fiduciary activities from the external portion of investment pools and individual investment accounts that are held in a trust that meets the following criteria: the assets are (a) administered through a trust in which the government itself is not a beneficiary, (b) dedicated to providing benefits to recipients in accordance with the benefit terms, and (c) legally protected from the creditors of the government. Contributions to the plan, and earnings on those contributions, are irrevocable. Pay-as-you-go plans do not qualify because they are “payments,” not contributions. Plan assets are dedicated solely to providing benefits to plan members in accordance with the benefit terms. Different plans (for example a pension and an OPEB plan) cannot be commingled in the same trust. The assets must be partitioned for specific plans. Plan assets are legally protected from creditors. If you are acting as administrator for someone else’s pension/OPEB plans, the plans still must meet the criteria above to be reported in a trust fund. Code 620-629 Private-Purpose Trust Funds – should be used to report all fiduciary activities that (a) are not required to be reported in pension (and other employee benefit) trust funds or investment trust funds, and (b) are held in a trust that meets the following criteria: the assets are (a) administered through a trust in which the government itself is not a beneficiary, (b) dedicated to providing benefits to recipients in accordance with the benefit terms, and (c) legally protected from the creditors of the government. Code 630-698 Custodial Funds – should be used to report all fiduciary activities that are not required to be reported in pension (and other employee benefit) trust funds, investment trust funds or private purpose trust funds. The external portion of the investment pools that are not held in trust that meets criteria listed above should be reported in a separate external investment pool fund column under the custodial funds classification. Code 699 External Investment Pool Fund – The external portion of the investment pools that are not held in trust and meet criteria listed above. Although this is consider a custodial fund, it should be reported in a separate external investment pool fund column under the custodial funds classification. Governments should establish and maintain those funds required by law and sound financial administration. Only the minimum number of funds consistent with legal and operating requirements should be established. Using numerous funds results in inflexibility, undue complexity, and inefficient financial administration. a. An annual/biennial budget must be adopted by every government. c. Budgetary comparisons must be included in the appropriate financial statements and schedules for funds for which an annual/biennial budget has been adopted. a. Interfund transfers, proceeds of general long-term debt issues and material proceeds of capital asset disposition should be classified separately from fund revenues and expenditures. b. Governmental fund revenues should be classified by fund and by the sources indicated in BARS Account Export. Expenditures should be classified by fund and by the categories indicated in BARS Account Export. c. Proprietary fund revenues and expenses should be classified in essentially the same manner as those of similar business organizations, functions, or activities. b. 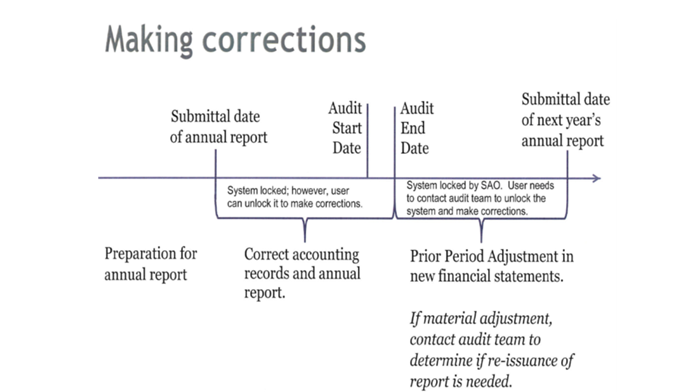 Annual reporting requirements are prescribed by the State Auditor’s Office. See Reporting Requirements and Filing Instructions for Cities and Counties or Reporting Requirements and Filing Instructions for Special Purpose Districts for details.